Tear-Jerker British Ad Re-Creates Elton John's Christmas Past The British department store chain John Lewis & Partners is famous for its heart-wrenching Christmas ads. This year's edition features a very famous musician and a life-altering gift. Every year, the British department store chain John Lewis & Partners releases a hotly anticipated, big-budget Christmas ad. Last year's had a lovable monster. Previous installments featured four-legged trampolinists, a lonely man on the moon, a lovelorn penguin, an animated woodland duo. But this year's advertisement opens with something far less fantastical: A pensive-looking Elton John, sitting at a piano in a quiet living room. He starts to play the opening notes of "Your Song" and then — well, see for yourself. 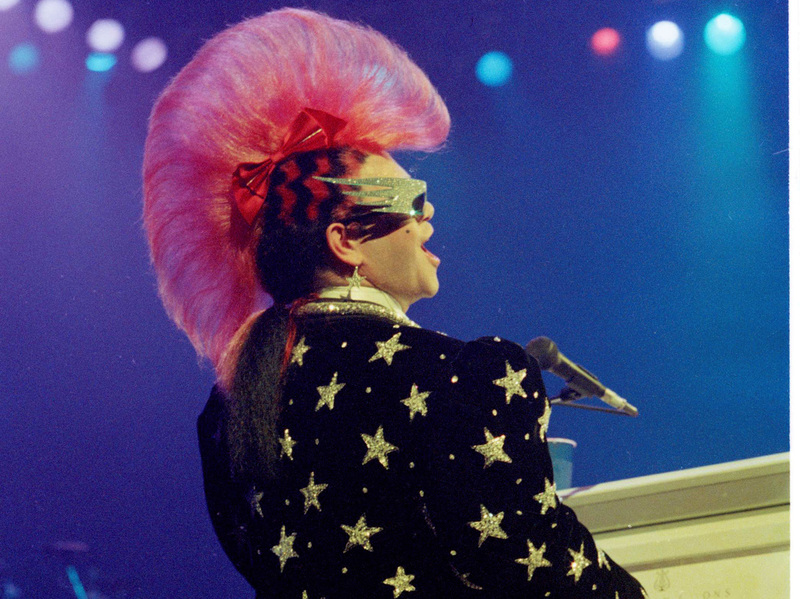 Elton John and his mohawk perform at Universal Amphitheater in Universal City, Calif., in 1986. From a packed stadium to rollicking tour plane to the sudden silence of a recording studio, the song shifts in its sound as the ad moves back in time. And then, as the song continues playing, we see Elton John before "Your Song" ever existed: a young man entertaining his family, a kid at a recital and finally, a small boy enchanted by the gift of a piano. A gift that would — let the music swell! — change his life. "Some gifts are more than just a gift," the ad concludes. John was indeed introduced to music as a young boy, on his grandmother's piano, although it's not clear if the piano was ever wrapped up as a Christmas gift. His representatives have not responded to NPR's requests for clarification. In a statement, John said making the ad was "a lovely opportunity for me to reflect on my life in music and the incredible journey I have been on, and how first playing my Grandmother's piano marks the moment when music came into my life." The ad has had a mixed response. It did bring many people (including, reluctantly, your humble reporter) to tears. But a number of people questioned whether it was truly "Christmassy." And it was also denounced as even more crassly commercial than usual — a high bar given that this is literally a commercial. Elton John is currently on his "Farewell Yellow Brick Road" tour, and tickets for many U.K. venues go on sale Friday. And a biopic called Rocketman is coming out next year. The timing screams "shameless plug" to many Brits.